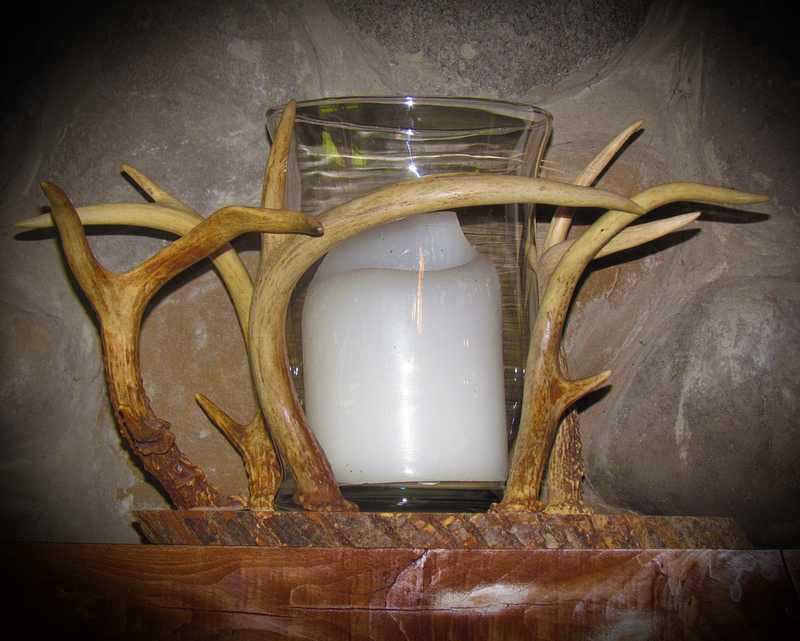 I’m a huge fan of natural deer antlers and love finding creative ways to incorporate them into the home. Here’s some of my deer antler decor. Anything else uniquely deer is also featured. 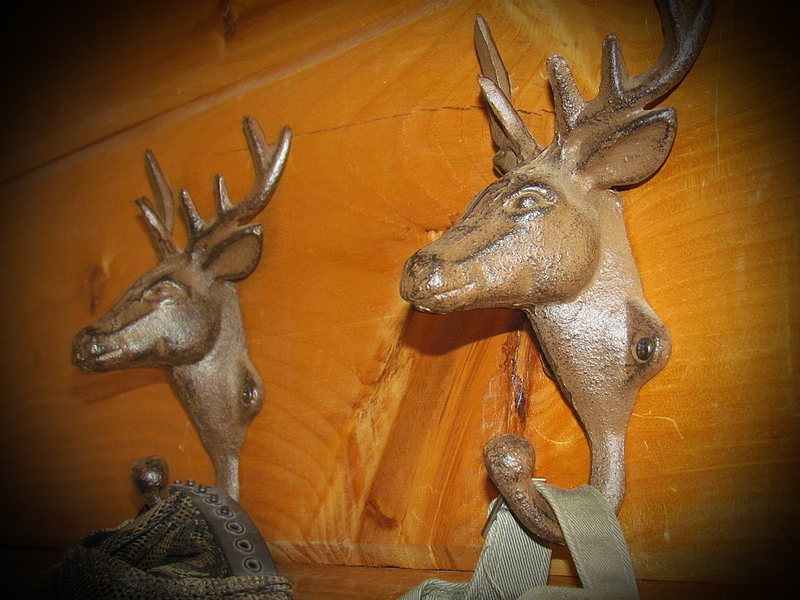 These deer hooks are strong and functional – I wish I could remember where I got them so I can give them credit! 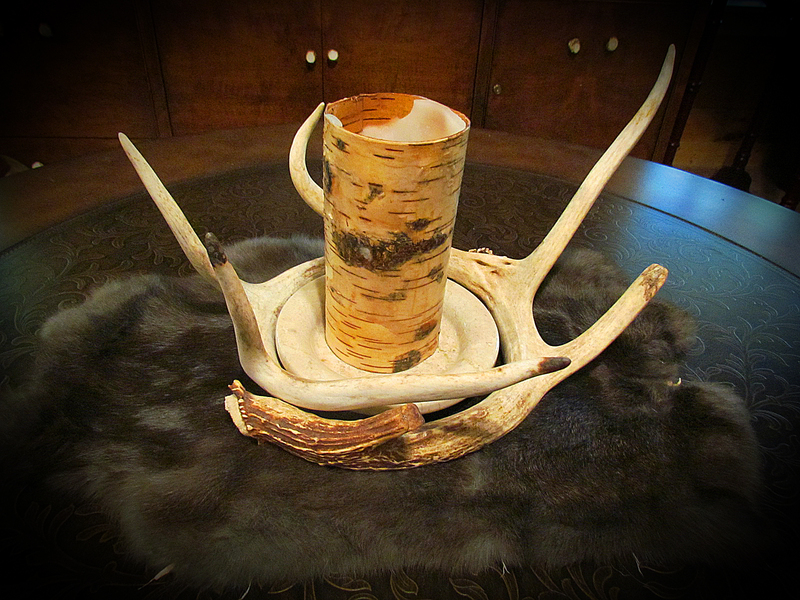 I incorporated these mismatched deer antlers by laying them around this candle base, which they happened fit perfectly. 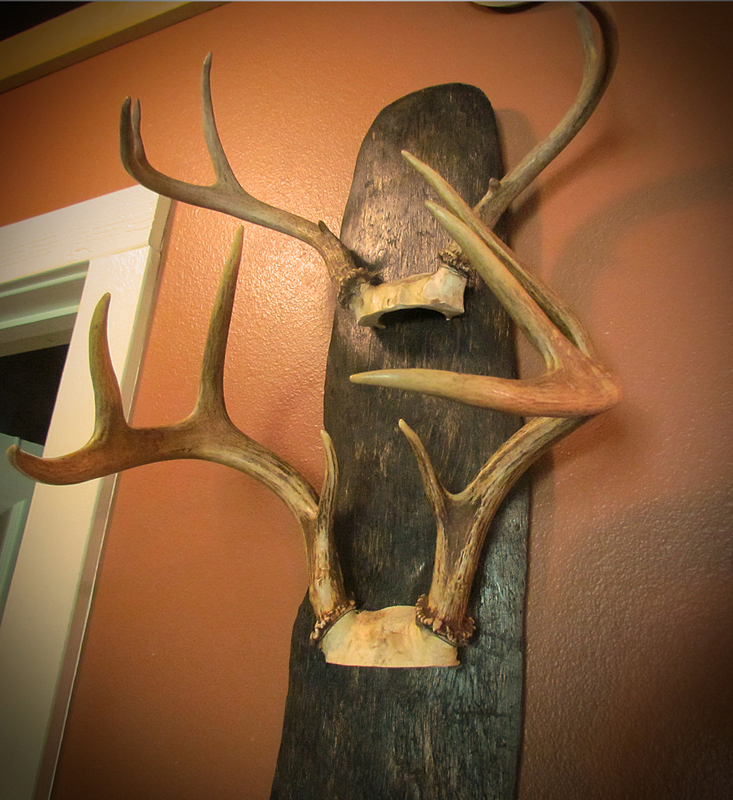 I hung these deer antlers on a piece of drift wood I pulled out of Lake Michigan. I stained the drift wood to darken it and gave it a light coat of polyurethane. I was looking for another way to display antlers other than the standard mount. 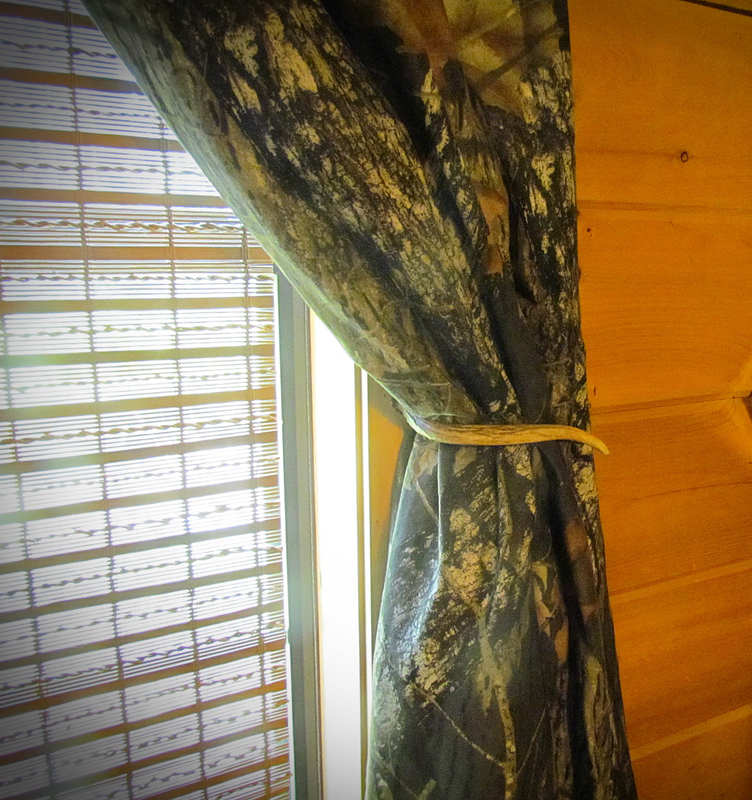 This was a great use of deer antlers that are too small to mount but just the right size and shape to hold back the camo curtains! 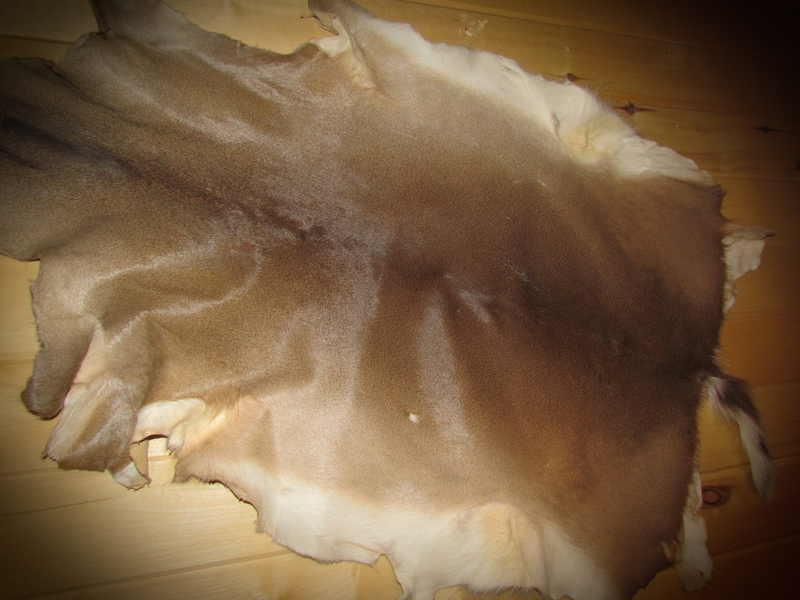 With all the antlers, there had to be a deer skin rug somewhere. This one was mounted on the wall versus just laying on the floor for less wear and tear. 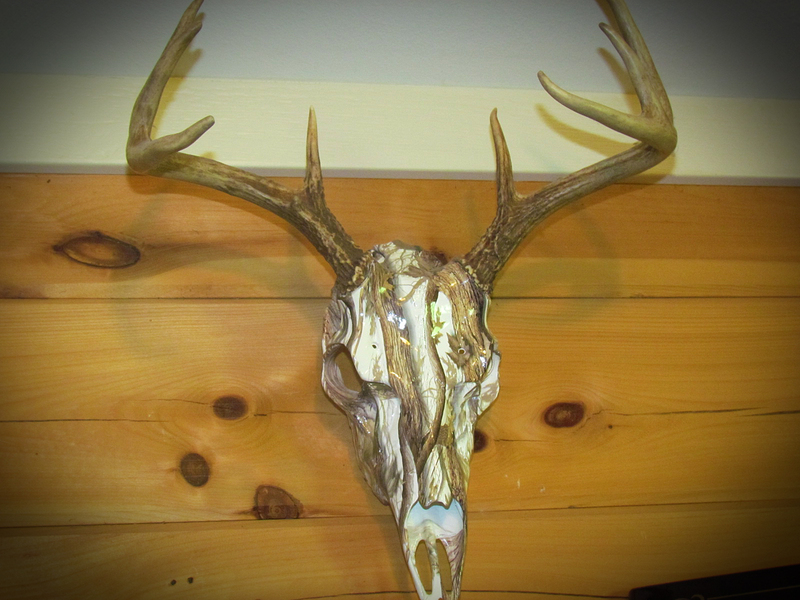 Just for variety, I tried this skull mount for a set of antlers. It gets a lot of compliments! These odd-shaped antlers were screwed onto a slice of natural wood purchased from a craft store. I purchased the glass candle holder separately and secured the antlers around them. They look magical when lit! 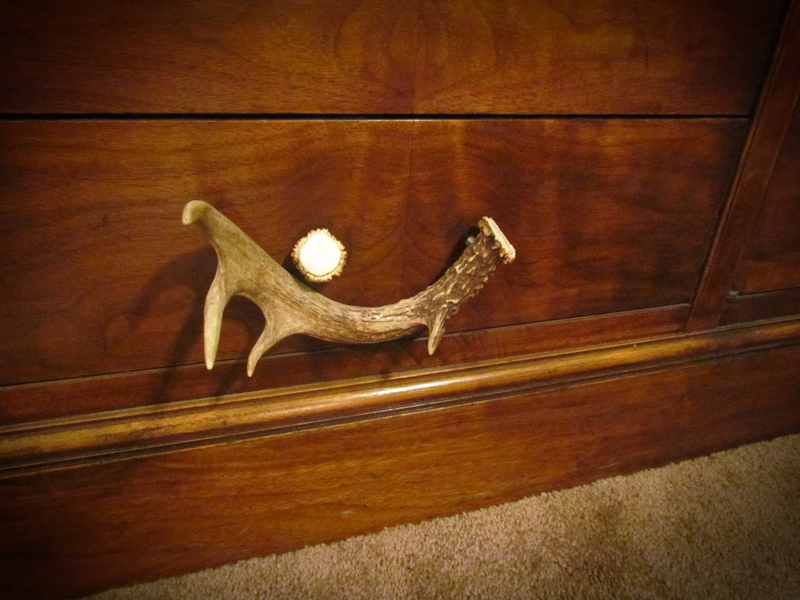 Another good use for odd-shaped antlers – drawer pulls! This trash can was originally a light maple color and had a duck with a blue bonnet on it! Needless to say the duck had to go. 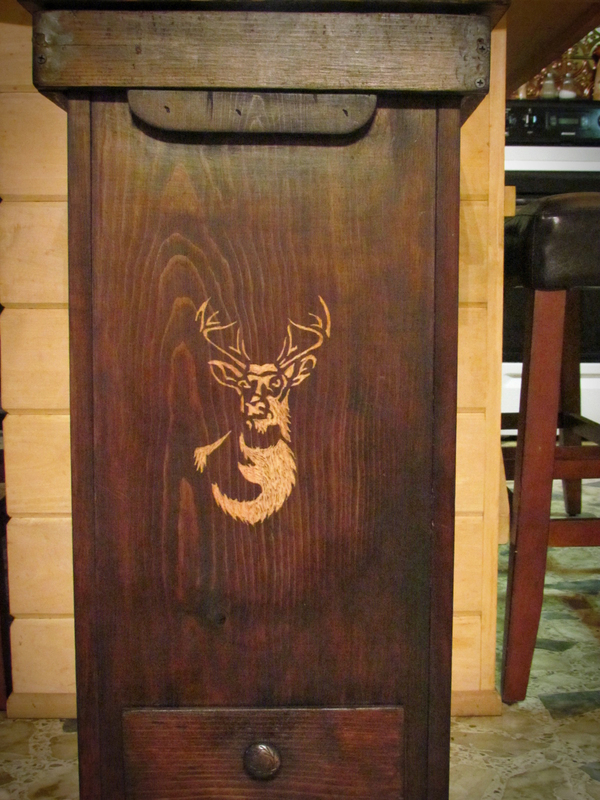 Got the dremel out and carved a deer on it. This started off as a table repurposing project but once I made the chess board I needed to make some chess pieces. If there is a way to embellish something I will probably do it. These porch rockers got a new coat of stain and then I used a dremel to embellish with deer antlers. After a new paint color on this wall, I saw this bronze switch plate and thought they went perfectly together. I loved these small antlers which weren’t really suitable for mounting so I framed them. Notice the deer antler hook that the robe is hanging on too? This was just a nice single antler that I wanted to make use of. I found these at World Market. I’m not sure what they are supposed to be but I painted them to match the bathroom trim and use them as toothbrush holders. They couldn’t be more functional! Another deer antler hook – why not? What else are you going to do with the odd-shaped antlers? 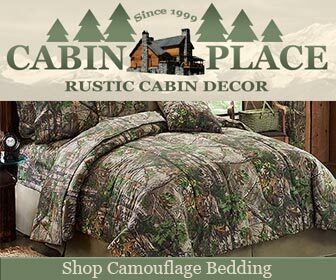 And what else are you going to hang your camo hat on? Pine cones and random deer horns in a bowl on the coffee table. Put together a puzzle and then framed in it using wood from an old pallet. Well, deer mounts are deer decor too.